The invisibility of women’s fishing related activities at the household, community and decision making levels leads to their exclusion from the institutional and technical support in a post-war context. ‘The woman left us slowly and moved to the other side of the beach seine, sat down on the sand and started piling the seaweed after the men removed it from their nets… The woman didn’t touch the seaweed till it was laid on the beach, sorted out by the men and placed outside their nets.’ (Observations, 14th Nov 2013 at Kinniya beach). I observed this process during a visit to Kinniya beach in the eastern Trincomalee district in Sri Lanka, as part of my PhD field research. At the time I remember wondering, why are these women not touching the seaweed till it is placed outside the net? Is it custom and tradition that’s preventing them from being involved in this particular part of the process? Would these women be allowed ‘inside the net’ if men acknowledged the fact that these women were supporting their families through this important income-generating activity? Would these women even be willing to be ‘inside the net’? I might not be able to answer all of these questions by the end of this blog, but I would like to elaborate on some of the issues linked to this situation. The Northern and Eastern provinces of Sri Lanka were directly affected by a 30-year war between the Government of Sri Lanka military forces and the LTTE that ended in May 2009. While most of the High Security Zones and restrictions on fishing have been removed, access to resources for livelihoods and markets depends on constant re/negotiation with actors within and outside the community (such as migrant fishermen and the military). Over the course of my research, I am confronted with the question: why do the men who are involved in fishing and drafting and implementing the policies which affect this livelihood see these women as being only on the fringes of fishing activities? Fishing is, and probably will remain, predominantly a man’s world in Sri Lanka. The men here talk about different fishing jobs: using gill nets, long-lining, trap fishing, crewing in multi-day boats – the list goes on. When I asked fisheries officials, community leaders and fishermen (all of whom are men), whether women are involved in fishing related activities, the answer I get is, ‘they support us by providing meals and they make dry fish, that’s it’. But when my research team and I visited fishing communities in Trincomalee, we saw something different. Women were in lagoons and shallow sea areas, up to their knees in water, collecting matti or gleaning clam, catching prawns with their hands or collecting seaweed. Discussions about women and fishing are nothing new and considerable progress has been made to improve their visibility. Early reports from the Bay of Bengal [^]project highlight the lack of data to make a strong case for the extent of women’s engagement in the fisheries sector. Over the decades, data collection and academic interest in gender issues around fishing seems to have increased and a body of literature now exists detailing how women are involved in fishing. However, it could be argued that their contribution to the fisher household economy, and the sector as whole, is still underestimated or ignored. For example, some researchers have found that activities such as gleaning and near-shore fishing and pre- and post-harvest activities, such as mending nets, preparing fishing gear and food for fishers, are not recognised as ‘productive employment [^]’. In other words they are not recognised as activities that bring in sufficient returns to labour to allow an individual and their dependants a level of consumption which is above the poverty line. It is also the case that gender disaggregated data on the fisheries sector in developing countries, which could inform more sustainable and efficient policies and practices, is still lacking. For example, in Sri Lanka, available statistics only include fishermen and fisher households as categories. Ethnographic studies such as ‘On the Beach [^]’ capture the traditional role of women in fish marketing in the North-Western coastal areas of the country. 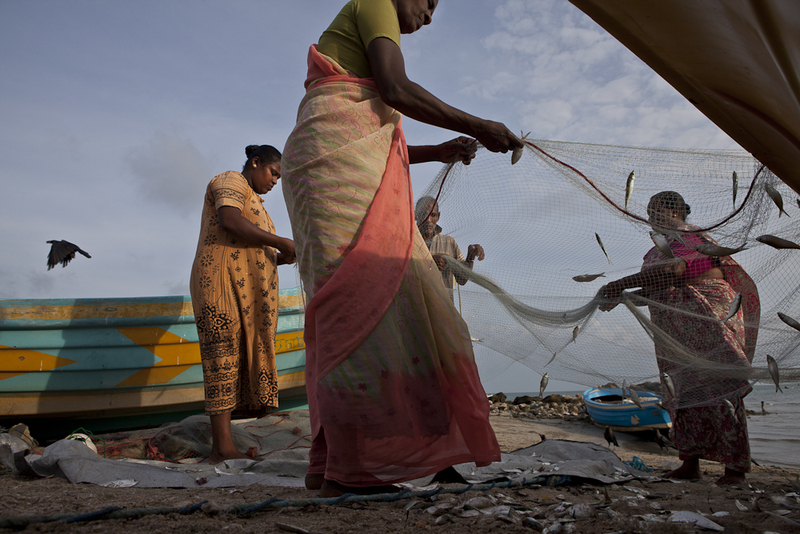 However, women’s involvement in fishing in Trincomalee remains invisible. With 18% of the fishers in the country coming from Trincomalee, fishing is one of the main employment providers for its people, but women seem to be left ‘outside the net’. This exclusion results in a lack of support to women’s fishing-related activities in terms of technical assistance and institutional support during negotiations with other actors which would enable them to access resources in this post-war context. The invisibility of women’s participation means they lack institutional recognition and get excluded from the decision-making processes at both a household and community level. Fishermen who produce large quantities of marine resources are included in programme interventions and management systems. However, the women who engage in labour-intensive and time-consuming tasks, such as gathering molluscs and oysters, continue to operate at a very primary level with minimal recognition and support. To illustrate this, following a drowning incident the navy banned a group of about 9 female gleaners from using their vallam (non-mechanised craft) in the shallow seas off Trincomalee. Without membership of a fisheries society, women have to engage in negotiations with the navy directly, which they do as an informal group. These negotiations are taking place within a post-war context, between armed men who speak a national language not shared by women from a minority ethnic group. To me this shows the power asymmetries underlying this negotiation process which a level of institutional recognition could address. I am not necessarily suggesting that bringing these women ‘inside the net’ is the solution, but what I am suggesting is that we need to recognise the activities that they do outside the net as productive activities at the household, community and decision-making levels to ensure their contribution is recognised and their livelihood is protected.